I want to gradually move from mach3 to linuxcnc. I often have to change the interface for different clients. I'm new to programming and using linuxcnc, so I often have questions. I had previously asked my questions in this topic , but Chris asked me to create a separate one. Before that, everything worked well. But now FileDialog does not open the control program. Is this with the demo screen or a screen you designed? If it is your design than please check there is a screenoptions widget added. Screen options sets up the preference file and other things - it will add nothing visually. I should add code to not crash if there is no preference file. It uses it to remember what folder you were in last. This was my screen and I didn't add the screen option. The demo screen worked at this time. I want to ask about slots and signals, to run small python scripts. Thank you for helping me, I am very grateful to you! You can use signals and slots to connect widgets to python code. 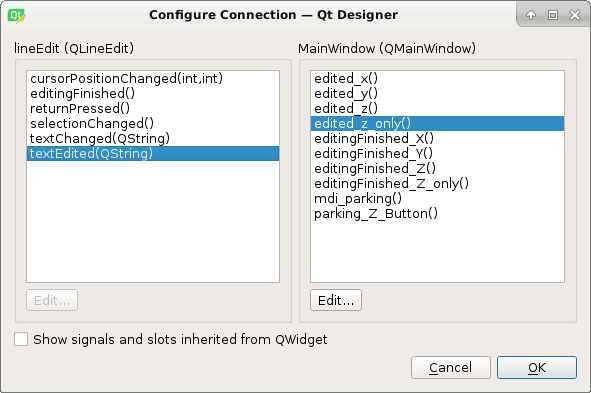 The sample qt_800x600 uses signals and slot for some of it's widget controls. Have you added a handler file in your config folder? You need to connect signals to the MainWindow and add the function names you would like, then add those functions to your handler file. I can give more details if you like - I'll try to add some detail about it in the docs. I'll assume debian stretch but there are only little differences. When you have loaded your screen into designer add a plain button to the screen. There is a button on the top for editing signals. Slide this arrow to a part of the main window that does not have widgets on it. A 'Configure Connections' dialog will pop up. 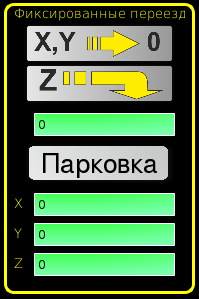 The list on the left are the available signals from the widget. The list on the right is the available slots on the main window and you can add to it. Pick a signal, say 'clicked()' - this makes the slots side available. click 'edit' on the slots list. A 'Slots/Signals of MainWindow' dialog will pop up. On the slots list at the top there is a plus icon - click it. you can now edit a new slot name. You'll be back to the 'Configure Connections' dialog. now you can select your new slot in the slot list. then press ok and save the file. Now you must add the function to the handler file. We will add some code to print the widget name. In fact it doesn't matter where you put the commands but by convention this is where to put it. add the code and save it. If all went well, after you run your screen now, when you push your new button it will print the button name in the terminal. Any feedback on the project? I was temporarily going back to using Axis, to adjust the angular axes. Your tutorial on signals and slots helped me. Thank you! I need three buttons for fixed moves: the First to move X and Y to zero. The second to move Z to"N". The third is to move X to" N", Y to" N "and Z to"N". # the widgets are instantiated. # so we catch and process the events directly. Last edit: 17 Jul 2018 12:03 by Ilya. Now I have a problem with the jogincrements widget. First, if i specify 1mm in the INI file, the axis shifts by 0.001 mm. The axis is shifted by 1 mm only if the ini file specifies just 1 (without mm). for example: "INCREMENTS = 1 2 5" or "INCREMENTS = 1mm 2mm 5mm"
Secondly, to go all the way to hold the button on the keyboard until the axis will pass the desired distance. If you release the button, the axis stops before the specified distance passes. I hope I wrote understandably..
Last edit: 17 Jul 2018 12:56 by Ilya.